Your favorite sub-zero heroes are back for another incredible adventure in the super-cool animated comedy Ice Age: The Meltdown! The action heats up - and so does the temperature - for Manny, Sid, Diego and Scrat. Trying to escape the valley to avoid a flood of trouble, the comical creatures embark on a hilarious journey across the thawing landscape and meet Ellie, a female woolly mammoth who melts Manny's heart. With its dazzling animation, unforgettable characters and an all-new Scrat short, Ice Age: The Meltdown is laugh-out-loud fun for the whole family! $68.033 million on -unknown- screens. Back when Ice Age hit movie screens in the spring of 2002, it established that a studio other than Disney or DreamWorks could create a hit animated flick. 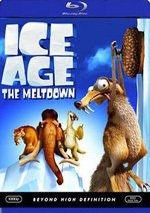 To show they can keep up with the big boys, Fox produced a sequel, 2006’s Ice Age – The Meltdown, and it proved even more successful. While the original took in $176 million, Meltdown topped out with an impressive $195 million. Too bad the sequel wasn’t as good as its predecessor. Meltdown picks up on the adventures of characters from the first flick. These include Manny the wooly mammoth (voiced by Ray Romano), Sid the sloth (John Leguizamo) and Diego the saber-toothed tiger (Denis Leary). As was the case with the first movie, Manny remains depressed about the loss of his family. Other issues weigh on the group as well since it looks like the Ice Age is ending and everything will melt. These two issues motivate much of the story. A local dam will soon bust and drown all the creatures that don’t immediately evacuate. They need to hike a fair distance in a short period of time to get to a boat and make it away from the flood. As an additional threat, some vicious aquatic beasts escape from the melting ice and chase after the evacuees. Manny leads the way, and along their travels, he discovers he’s not the last of the wooly mammoths. He runs into another mammoth named Ellie (Queen Latifah). However, since possums raised her, she believes she’s one of their kind. Manny has to deal with that odd side of things to woo her and save the species. The movie follows their relationship as well as the march to survive the impending flood. To say that the original Ice Age left me underwhelmed would be completely accurate. It offered mild entertainment but never became anything more involving than that. I came, I saw, I pretty much forgot about it. With such modest heights to scale once again, it seems to me that Meltdown should have been able to equal the minor pleasures of its predecessor. Unfortunately, it disappoints. At least the original boasted something somewhat unusual in regard to setting and characters; the sequel can’t even claim anything new in those departments. On the positive side, the sequel’s animation substantially betters the work for the first film. 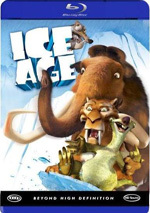 Even in 2002, parts of Ice Age looked clumsy, and those elements didn’t age well; viewed in 2010, the original movie’s animation seems plastic and fake. Meltdown didn’t quite achieve animated greatness, but I found less about which to complain here. Yeah, some of the elements lacked the appropriate organic feel, but these seemed reasonably well rendered. Maybe I thought Meltdown looked good just because I viewed it soon after a screening of the original, but it nonetheless clearly represents a substantial technological/artistic step up in quality. Unfortunately, that’s the only area in which Meltdown works better. The story sure fails to explore any fresh ground. What was the message of the first movie? Family. What’s the message of the second movie? Family. The two flicks take somewhat different paths to explore their themes, but they don’t vary in truly substantial ways. They go down similar paths and end up in nearly identical places. At only 90 minutes, Meltdown doesn’t sound like a long film. However, there’s “real time” and there’s “stuck in the theater time”. Although the movie spanned only 90 minutes real time, it came across as about 10 hours “stuck in the theater” time. Hoo boy, does Meltdown drag! A lot of the problem stems from the lack of story inspiration. Meltdown rehashes the same “family” theme but it fails to involve all the characters very well. Manny and Ellie are clearly the focus of this one, so Sid and Diego get shunted to the sidelines. Sure, they have their own little subplots; Diego tries to conquer his fear of water while Sid finds a society of mini-sloths that worship him. Neither of those elements really goes anywhere, and they feel tacked on just to give those characters something to do. In essence, Meltdown amounts to a long series of sight gags in search of a real story. It incorporates all sorts of wacky bits that fail to meld together well. Instead, the movie often comes across as a loose collection of shorts instead of one coherent flick. And that’s what kills it. The film’s obsession with potty gags doesn’t help, but I could excuse that if Meltdown actually managed a moderately interesting plot or compelling characters. It prefers to just echo the uninspired original flick to become something even less interesting. 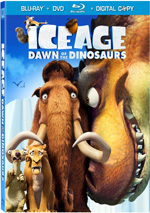 Ice Age – The Meltdown appears in an aspect ratio of approximately 1.85:1 on this Blu-ray Disc. Like the Blu-ray for the first film, Meltdown usually looked great, but it suffered from some lapses. All of those connected to sharpness. The majority of the flick displayed good clarity, and it occasionally boasted genuinely excellent definition. However, more than a few wide shots lacked great detail and could look a smidgen soft. Those were fairly infrequent, but they detracted from the overall experience. Jagged edges and shimmering remained absent, and only a smidgen of edge enhancement appeared. I also found no source flaws. Meltdown started with a chilly bluish-white palette but warmed up as the surface temperature increased. Much of the movie offered a nice natural look with lively greens and blues. Blacks came across as deep and rich, while shadows presented good clarity and visibility. Due to sporadic softness, this ended up as a positive but not great presentation. On the other hand, the DTS-HD MA 5.1 soundtrack of Meltdown worked consistently well. With cracking ice and all sorts of action sequences, the movie boasted many opportunities to feature all five speakers. It did so quite well. Various effects elements zoomed around the room to create a fine sense of immersion. The pieces meshed together smoothly and transitioned well. Localization was clean and precise, and the score featured solid stereo imaging. The mix turned into a broad, encompassing piece. How did the picture and sound of the Blu-ray compare to those of the movie’s DVD edition? I liked the audio for the DVD quite a lot, but the lossless track boasted even more punch. The DTS mix added a bit more depth and impact to the proceedings. Even though the transfer doesn’t consistently excel, it still betters the DVD. The visuals demonstrated a better sense of definition and vivacity. While it wasn’t the slam-dunk I wanted, the transfer was a good upgrade over the DVD. Most of the DVD’s extras reappear here. These open with two separate audio commentaries. The first presents director Carlos Saldanha in a running, screen-specific piece. He discusses challenges related to making a sequel, returning characters and new personalities, technical and animation issues, storytelling and editing, actors and performances, and other production topics. Eternally chipper, Saldanha offers a very informative chat. He covers the appropriate material in a reasonably thorough manner and makes matters entertaining as well. Due to his sunny personality, I worried Saldanha would throw out tons of praise, but he avoids that trap. Instead, he focuses on the useful details in this excellent track. For the second commentary, we hear from producer Lori Forte, art director Thomas Cardone, materials supervisor Michael Eringus, animation supervisors James Bresnahan, Galen Tan Chu and Michael Thurmier, effects supervisor Robert V. Cavaleri, lighting supervisor David Esneault, story artist Chris Renaud, lead animator Aaron Hartline, technical animation lead Matthew D. Simmons, and senior lighting lead Andrew Beddini. To my surprise, all of these folks sit together for a running, screen-specific discussion; with so many participants, I anticipated an edited affair. The content of the commentary offers fewer surprises, though, as it covers expected subjects. We get notes about many technical issues. The track examines character design and animation, other visual decisions, story development and related choices, problems related to making a sequel, the film’s rushed production schedule, updating old characters and introducing new ones, and many nuts and bolts related to the execution of the material. As I went into this track, I feared it’d be chaotic due to the number of participants. However, it works just fine. Forte acts as ringleader of sorts, and to my great surprise, no one ever interrupts or speaks over the others. They cover the topics in a concise and informative manner that helps make this a pretty good track. The subject matter means it occasionally can be a little dry, but it still offers a solid overview of animation techniques. In addition to the commentaries, we find a slew of little video pieces under “Meltdown Shorts”. Crash and Eddie Stunts breaks down into three components: “Lava’s Leap” (0:21), “Dungball Dribble” (0:21) and “Peace Out Duel” (0:21). Each of these offers a short animated clip in which we watch the possum characters do some wacky activities. They’re mildly amusing at best. Called Outtake Prank, a 17-second clip shows a bit the animators did for fun. It uses the possums in an alternate version of an existing scene. It’s insubstantial but cute. The ever-popular Scrat reappears in a new short called No Time for Nuts. In this seven-minute and nine-second cartoon, the squirrel comes across a time machine and chases nuts throughout the centuries. It’s a fairly effective twist on Scrat’s usual shenanigans. For some multi-angle material, we go to The Animation Director’s Chair. This consists of six scenes from the movie: “Play Dead” (1:33), “Fish Story” (1:02), “Nuts” (1:45), “Family” (1:33), “Face Off” (1:27) and “Drain” (1:15). Four of the segments can be viewed in any of five modes: “Storyboard”, “Layout”, “Animation”, “Combo” and “Final”. “Fish Story” and “Nuts” drop the “Layout” option but include the other four. These let us see the scenes at various stages along the way toward completion. I like this kind of feature, as it gives us a fun way to inspect the animation processes. A collection of Lost Historical Films let us see more about the movie’s animals. We find “The Sloth” (2:01), “The Wooly Mammoth” (2:01), “The Saber-Toothed Squirrel” (1:49), “The Saber-Toothed Tiger” (1:26), “The Vulture” (1:22) and “The Possum” (1:24). These offer humorous fake educational programs, each of which features basics about the real-life critters and gags. This is a simple but fun feature, especially when we get narration from John Leguizamo for the “Sloth” entry. The Artist Gallery Channel provides something to check out as you watch the movie. If you activate this feature, you’ll see examples of color keys, storyboards, and character model “callouts”. These appear in the bottom lower left corner of the screen. The art pops up on a frequent basis, and the presentation means that they don’t intrude on the movie viewing experience; you can easily watch the flick and glance at the art along the way. I like this feature and think it gives us a good way to check out the planning material created for the film. Audio comes to the forefront in Scrat’s Piranha Smackdown Sound Effects Lab. This allows us to view the same 37-second clip of Scrat and some piranhas but with different effects for each one. It’s a moderately fun way to see how various audio elements affect the same piece of material. The disc includes a Sneak Peek at The Simpsons Movie. This 63-second clip shows a rough animated scene from the flick. This was interesting before the film’s release, but years later, it’s not too worthwhile. Finally, Trailers provides ads for Ice Age, Fantastic Four, The League of Extraordinary Gentlemen and Planet of the Apes. No trailer for Meltdown appears here. What does the Blu-ray drop from the DVD? We lose two promotional character featurettes, a look at actor John Leguizamo’s work, a mini-blooper reel, a dance tutorial, and some TV promos. A few of these were pretty fun, so it’s too bad the Blu-ray omits them – and it’s perplexing as well. Although the original film offered only modest pleasures, Ice Age – The Meltdown couldn’t even live up to its minor legacy. Disjointed and rarely amusing, the sequel fails to stake out any interesting territory. The Blu-ray presents generally good picture and excellent audio along with a positive roster of extras headlined by two useful audio commentaries. The Blu-ray gives fans a fairly solid version of the flick, but I must admit Meltdown remains a definite disappointment for me.